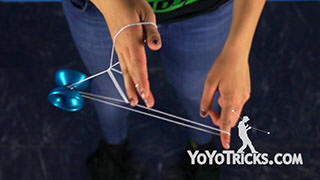 How to perform the YoYo Trick Neverland by Tessa Piccillo. 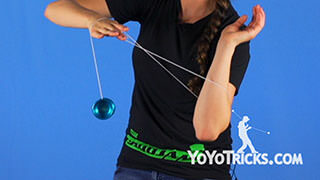 Neverland Yoyo TrickThis trick is called Neverland and this is what it looks like. So to begin this trick you are going to do a Brent which is what I showed you in another video but this time you are going to catch it with your elbow like that. Once you get into this you are going to pass the yoyo between the two strings here and bring it in front of your opposite arm, once you get to this point, you are going to grab where the strings cross with your throw hand and make sure that your pinky is up. You are going to see this loop around your elbow so release that and swing it around to the back and hook that on your thumb and as you do that, land it onto your first finger there. So once you get all these steps down you are going to be able to do this a fluid motion. So from here you are going to grab the strings that cross once again right here on top of your palm, then flip that slack on top of your thumb. 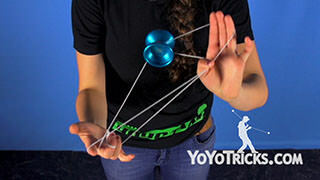 Once you here dismount the yoyo turning your palm up on your throw hand swing the yoyo up and over all of these strings so it will land on this back string in between the two thumbs like that. After that you are going to drop from your non throw hand and it will end up in something that looks similar to a Wrist Mount, and that will set you up for the rest of the trick. So to set the next part of the trick you are going to make sure that your palm is facing you that these strings are hooked around your wrist. 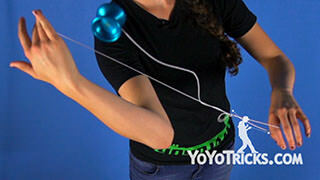 So what we are going to do next is land the yoyo on this back string right here like that and in order to do that you are going to hook your finger on this string, invert it and land it behind your opposite arm, then once you do that stretch your arm out to avoid the yoyo from snagging. You are going to drop this loop over wrist right here to create a green triangle and once you got that you are going to push the yoyo out to reject it and catch onto the back of your throw hand. So in order to land that trapeze behind your wrist, you are going to bend your elbow and turn your wrist in and land it on that string right there so it will come around like that. 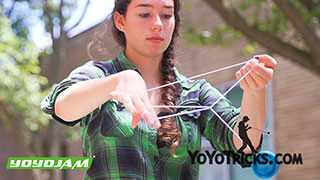 Then to finish the trick, you are going to dismount the yoyo by throwing it up and over into a twisted trapeze and that is Neverland.